Ketolides are a new class of antibacterials specially designed to combat respiratory tract pathogens that have acquired resistance to macrolides. The ketolides are derivatives of the macrolide erythromycin A. Telithromycin (Sanofi-Aventis’ s Ketek) is the first and only member of this new class to be approved for clinical use. The ketolides exhibit good activity against gram-positive and some gram-negative organisms, but their main advantage is their excellent activity against erythromycin-resistant S. pneumoniae. Resistance to existing macrolide antibiotics creates an important commercial opportunity for entry of the “next-generation” macrolide antibiotics. Macrolides are currently a preferred class of antibacterials for first-line treatment of RTIs because of their spectrum of activity and ease of use. However, as resistance to these agents increase, the ketolides could replace them in the RTI market. Ketolides exert their antibacterial activity by interacting with the bacterial ribosome and inhibiting its ability to make new proteins. Ketolides bind to a portion of the rRNA on ribosomal proteins. Ketolides bind to a region of the ribosomes with higher affinity than macrolides. This binding could contribute to ketolide’s activity against macrolide-resistant strains. Abbott and Taisho were developing the ketolide cethromycin (ABT-773), the lead compound from a series of macrolide antibacterials, for the potential treatment of bacterial infections and respiratory infections in particular. Abbott was reportedly looking for a licensing partner for cethromycin in the Unites States and Europe. In Japan, Abbott continued to support the development of ABT-773 by partner Taisho. However, in April 2004, Taisho announced it had suspended its collaboration with Abbott because of Taisho’s changing development strategy and priority in its prescription pharmaceutical business. Abbott has released no further information on a licensing partner to continue development of cethromycin. 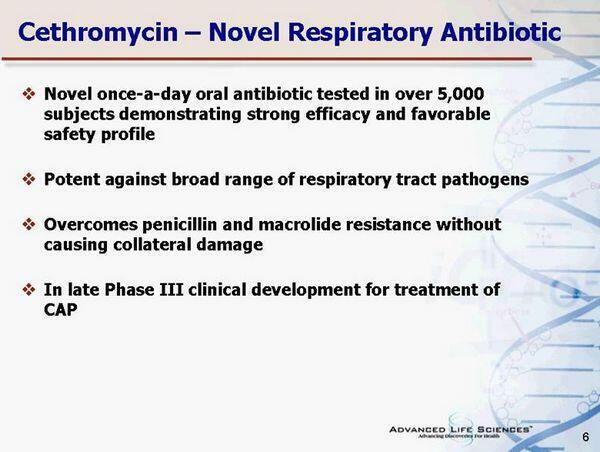 In vitro studies of cethromycin have found that the compound demonstrates very good activity against respiratory tract pathogens acquired in the community, including penicillin- and macrolide-resistant S. pneumoniae. Cethromycin’s in vitro efficacy against macrolide-resistant S. pneumoniae is superior to that of telithromycin, and it has demonstrated bactericidal activity against S. pneumoniae and H. influenzae in experimental models for pneumonia in rodents. 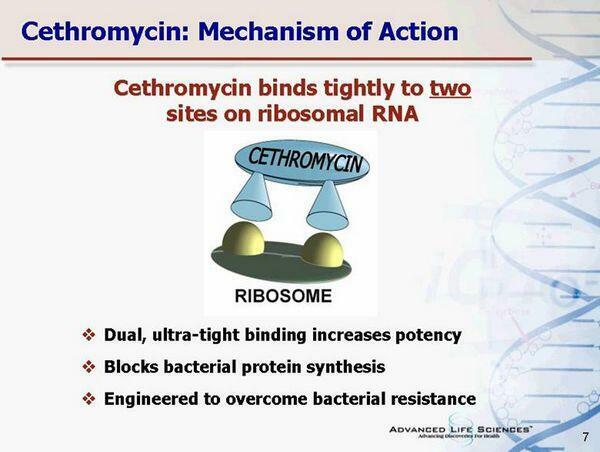 Pharmacokinetic information on cethromycin is still emerging. A Phase I clinical trial involving 48 healthy male volunteers suggests that, for a single oral dose (100-1,200 mg), adverse events were mild to moderate in severity, with GI disturbances being the most commonly reported events.